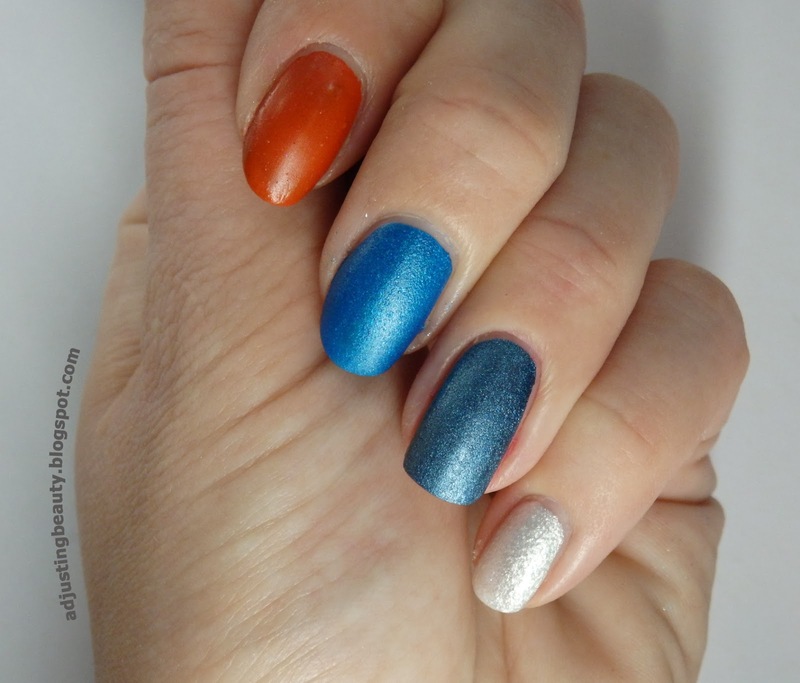 Somewhere in the summer I tried this DIY matte nail polish and when I used the one from Catrice LE Rocking Royals, I realized it looks very much like my DIY nail polish. I decided to play around with some more pigments and eye shadows and show what I came up with. I used my Bourjois 1 Second Gloss nail polish in 01 Transparent Glossy. For the application I just used the brush that comes with this nail polish, but to keep the nail polish as clean as you can, I would recommend using some old nail polish brush. 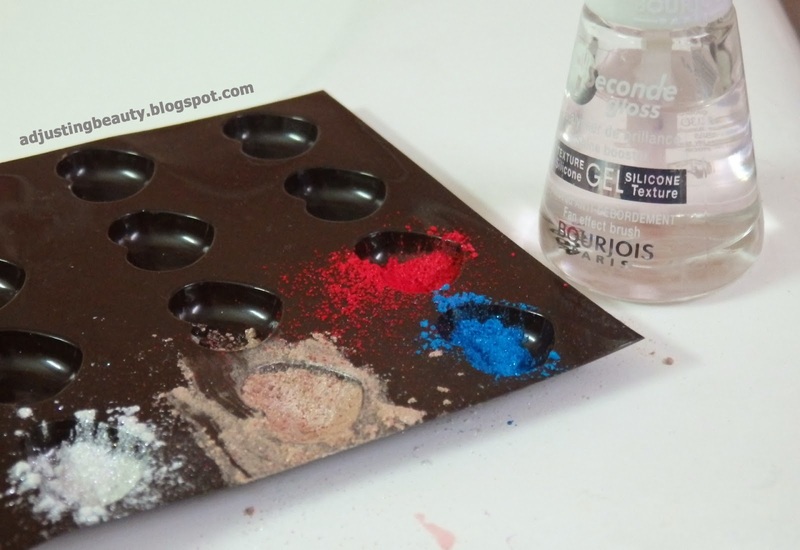 Then I used Essence pigments, which I also used for my DIY lipsticks / cream blushes. For one of my nails I used some random orange red eye shadow, from an unknown eye shadow palette. I used little plastic molds in which there was chocolate hearts before, but you can use any container you want. I simply filled those with pigments and mixed them with two drops of clear nail polish - that was a measurement for only one nail. I think the more glitter or shimmer you have in the pigments, the grainier the finish / the more texture there will be. That is the effect of the first nail polish on the photo below. 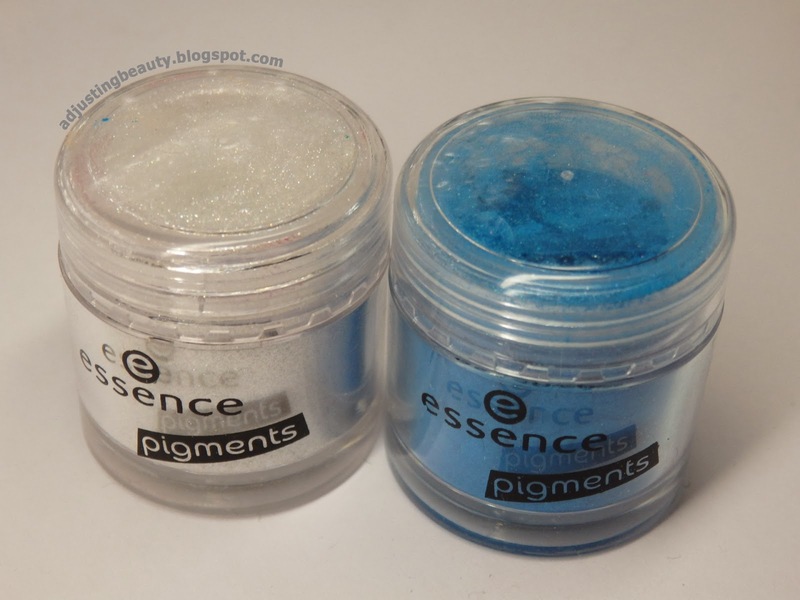 I used Essence pigments in 10 fairy dust. If you use pigments or eye shadow with a subtle shimmer the effect is the same as the nail polish I bought from Catrice's LE Rocking Royals. This is the second nail polish on the photo below. I used Essence pigments in 18 little mermaid. I also used matte eye shadow and the finish seemed a little bit like Essence's LE Rebels, which had latex nail polishes. 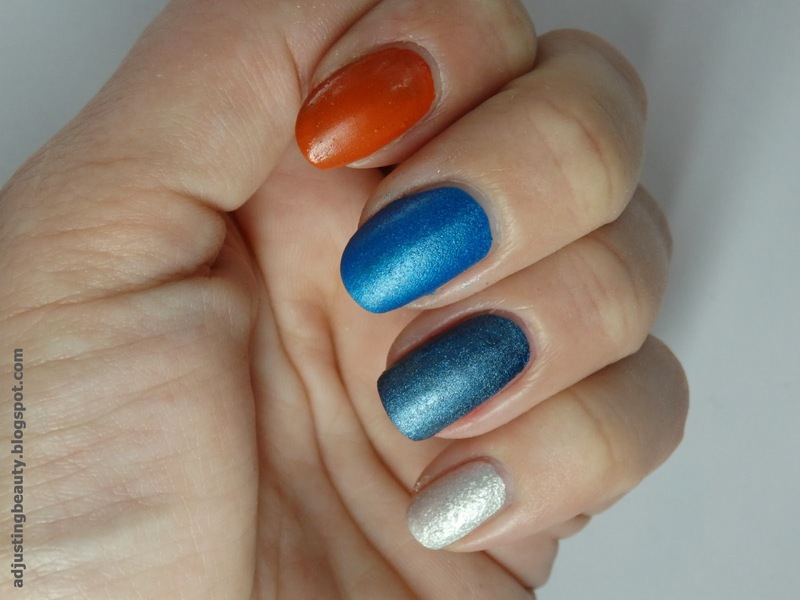 I used a random orange red eye shadow - that is the third nail polish on the photo below. 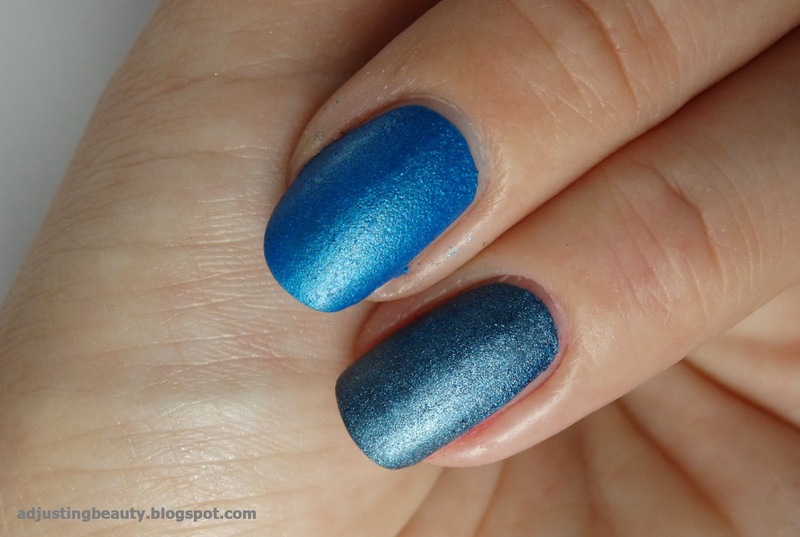 This is how my DIY nail polish looks like compared to the Catrice's Rocking Royals nail polish in C03 Royal Blue. Pretty close, isn't it? Dark pigments may stain your nails a lot. I also can't talk about how long lasting those manicures will be. Because mine were chipping very quickly. This is just an interesting finish to have and maybe use it only to play around with, when you have too much time on your hands. I really like those finishes, especially the white one, so I'm thinking I could use this technique for those cold winter times, to give my manicures something else ;). 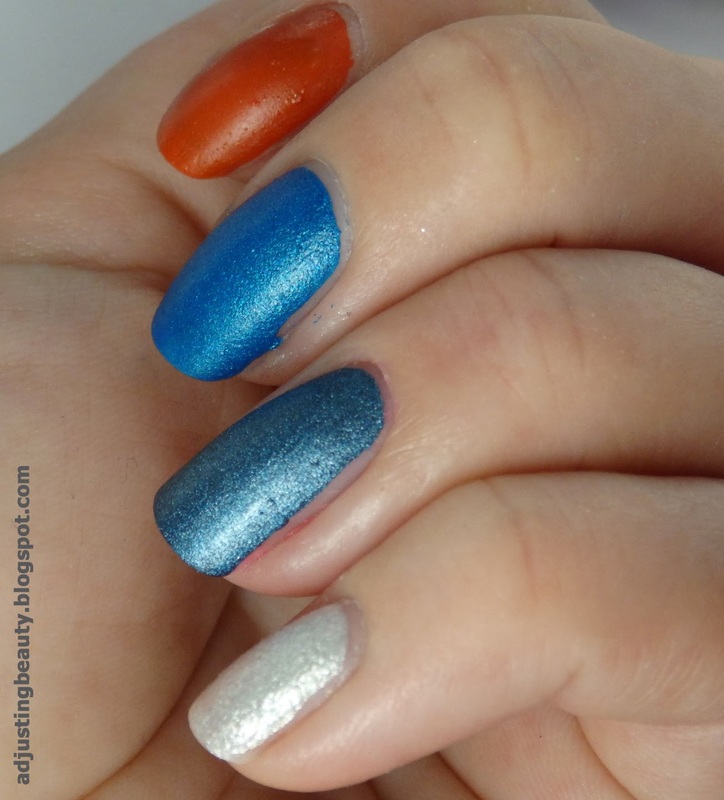 Do you like matte nail polishes? Which is your favorite finish from those, which I created? Noro, jaz bom to tudi sprobala. Zdaj si mi pa dala idejo kaj storiti s senčkami, ki jih ne uporabljam in z brezbarvnimi lakci, ki mi niso kul. Joj, napačen smiley, ta :) je bil mišljen.